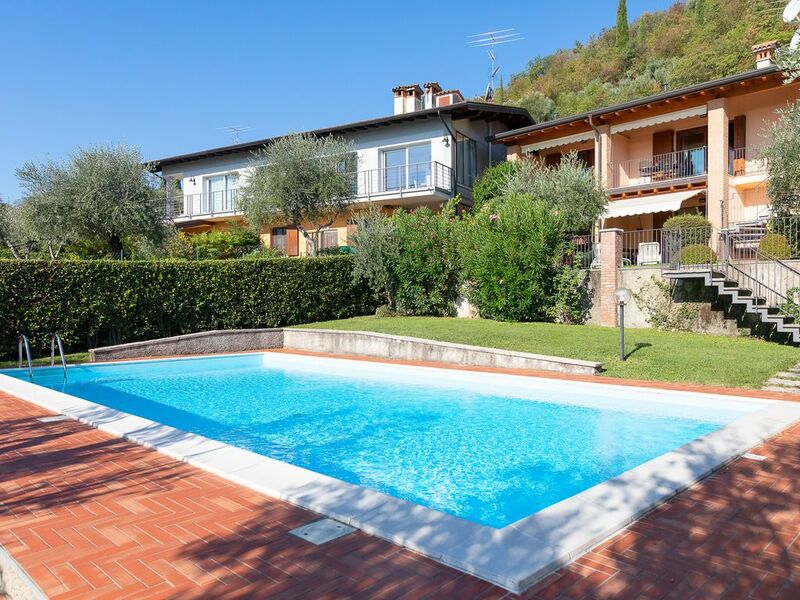 Situated in Toscolano-Maderno, in a convenient area with a stunning Lake view, in the residence "Le Olive" with pool, 2-bedroom apartment for a family or group holiday up to 6 people! The holiday apartment, provided with free Wi-Fi welcomes guests with the bright living room equipped with a sofa bed, dining table with chairs, flat-screen TV, fully equipped kitchen with refrigerator, freezer, oven, microwave, electric kettle, dish washer, coffe machine and toaster; the living room leads, through French doors to the outdoor private and covered terrace provided with a nice dining table with chairs, for stunning Lake view lunches and dinners; guests benefit also of the private rear garden where, during summer, to sunbath! The holiday apartment continues to delight with the master bedroom, equipped with a double bed with wardrobe, and the bathroom with shower, wash basin, bidet and WC. The apartment is equipped with a loft in the living room area, provided with a comfortable double bed for two, air conditioning, flat-screen TV and a further bathroom with wash basin, bidet and WC. Guests can easily park their car in the private garage within the Residence. Within the garage, guests benefit of the small laundry area with washing machine, iron and ironing board. The high quality finishes of the apartment, wood beams, modern and high quality furniture, guarantee comfort and relax to guests during their holiday at the Lake. From the Residence Le Olive, guests can easily reach the harbor, where the Lake Garda boats pick up cars to easily reach the East coast of the Lake in some minutes! The Residence is provided with a nice pool with sun beds, available from May 15th to September 30th! A baby cot and a high chair can be installed upon request with a small extra cost. Pets are welcomes upon request. From the Residence, guests can easily reach the Golf court "Bogliaco" (10 minutes by car), the famous city of Salò and Gardone Riviera (10 minutes), the entertainment parks of Gardaland and water park Caneva World (60 minutes), the harbor to rent boats and for boat tours on the Lake "touching" the cities of Bardolino, Lazise, Garda, Limone, Desenzano and Sirmione. To 70 minutes by car, or 30 with the train from Desenzano train station, guests can reach the famous city of Verona and enjoy the square of the city, the "Arena" and the historical Romeo & Juliet place; the city of Milano (100 minutes) and Venice (130 minutes) are also within easy reach from Dos del Sul by car and by train. Lake Garda can also offer boat rentals, cycling on the hills, rock climbing, golf, tennis, wine and local food taste and many other day trips. The apartment can be reached by the close Airport of Verona (VRN) with a 70 minutes drive.